HUNTER Wetlands Centre Australia turns 30 this weekend. It is an amazing achievement for our community, which restored and protected the site. Thousands of Novocastrians volunteered. Generous support flowed from governments, council, industry, service clubs and businesses. While celebrating and reflecting on these past three decades, I’ve had the privilege of talking about the future of the Hunter Estuary [FNS, EAAF010] with many long-term volunteers, scientists, community groups, industries and land managers. Here are some of my dreams for that future, often shared by many working and living in our estuary, which I aim to develop for consideration by the Board of the Hunter Wetlands Centre as we implement our new strategic plan. The Hunter estuary is a site of global significance for wetlands and migratory shorebirds. As well as being the world’s largest coal port, it’s also a Ramsar wetland of international significance, and the best stopover site in NSW for shorebirds that migrate along the East Asian-Australasian Flyway to Australia to spend a warm Christmas and escape freezing winters in China and Japan. But development pressures, water pollution, land clearing and invasive animals continue to see wetlands degraded and lost. I look forward to a time when a shared plan and governance arrangement exists to manage, develop, conserve and monitor the estuary. This would involve community organisations, industry, governments, key land managers, fishers, researchers and Indigenous traditional owners jointly developing a long-term plan that ensures the estuary is managed sustainably. We could draw on approaches adopted for Hobart’s Derwent estuary, south-east Queensland’s Healthy Waterways, and Darwin Harbour’s monitoring and former multi-stakeholder advisory committee. Rising sea levels due to climate change will cause mangroves to invade salt marsh and freshwater wetlands. Where will all the wildlife live as their habitats shrink? Hunter Wetlands National Park and private conservation reserves such as the Hunter Wetlands Centre should be expanded to restore and protect more freshwater wetlands in Hexham Swamp and along the Hunter River and its floodplains. This will create climate refuges for wetland wildlife this century, including threatened birds species that need freshwater wetlands such as Australasian Bittern, White-fronted Chat and Eastern Grass Owl. A collaborative ‘‘rewilding’’ program would provide a focus for joint efforts by conservationists, farmers, cattle producers, heavy industry and the National Parks and Wildlife Service. 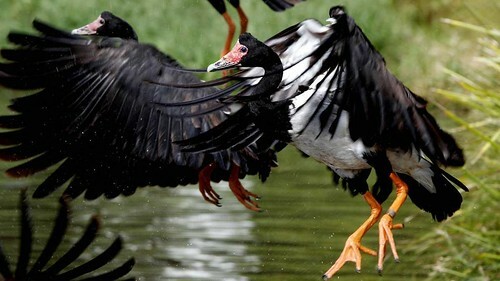 It’s already happened in places, such as at the Hunter Wetlands Centre when we re-introduced Magpie Geese. Kangaroos have recolonised Ash Island. Koalas could return as forests regrow. The top predator Spotted-tailed Quoll plus the majestic Brolga could be returned with landholder support. As part of rewilding efforts, the Hunter Wetlands Centre is investigating completing our fence to exclude foxes and cats, and so make it a truly safe wildlife sanctuary. We have started discussing potential wildlife re-introductions with conservation scientists and government agencies. The iconic woodland bird, the Bush Stone-Curlew, or knee-high cousins to wallabies such as Eastern Bettong could potentially live here again. Newcastle is a wetland city, and would benefit from a network of trails and cycleways to link various wetlands around the estuary. This would require infrastructure such as new bridges over the railway line and creeks, plus upgraded paths. A 10-kilometre loop accessible by cyclists, walkers and people using wheelchairs could link Ash Island, Hexham Swamp and the Hunter Wetlands Centre – great for tourism, nature lovers and people wanting to get healthy. Revegetation and remediation of the former Astra Street dump beside the Inner City Bypass at Sandgate presents an amazing opportunity for using native vegetation to help naturally treat contaminated landfill, enable public access once safe, and even a cafe with amazing views westwards over Hexham Swamp. Hunter Wetlands National Park provides a refuge for fish and wildlife. Re-establishing forests and wetlands would enhance its value to the people of the Hunter, its ecosystems and fisheries, and the tourism sector. The National Parks and Wildlife Service and other landholders have identified more than 100hectares of floodplains and surrounding forests that would benefit from a collective revegetation initiative. After 30 years, the wetlands at our site in Shortland are now well vegetated, and much wildlife has returned. We are looking for partners to set up a new Wetland Centre and restoration projects in the Hunter, or further afield, to do it all again. I would love your help to achieve these dreams. You can volunteer, enter into a biobanking agreement or offset with us, become a member, donate, sponsor a project, or make a bequest. Dr Stuart Blanch is CEO of Hunter Wetlands Centre Australia. These are his personal views.